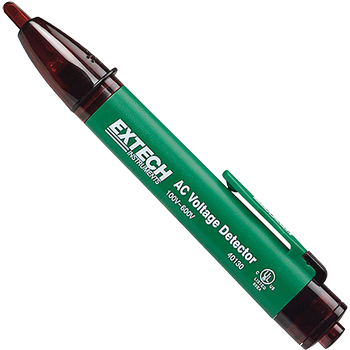 Detecting the presence of live wires before testing, this pocket-size AC voltage detector features a low-profile tip that can be inserted into outlet receptacles or used to trace along wire insulation to locate breaks. This detector measures from 100 to 600 VAC (50/60 Hz) with visual (flashing red LED) alarms and audible (beeping) tones that can be switched off. Use for line out testing, locating breaks and control panel troubleshooting. CE approved and UL Listed. Complete with convenient size with pocket clip, and two AAA batteries.